Frame: A strong, hot-dip galvanized inside and out and powder-painted (in white as standard, with many colors available), with a set up to 30 steel eye-bolts allowing you to attach additional equipment (such as lighting and sound systems) directly to the structure of the dome. Cover: A customizable opaque/translucent or transparent membrane cover. Our membrane covers are made of three-layer PVC material with B1 fire resistance certifications, a copy of which is included with every Geodome. Geodome kit: A complete set of fasteners, transport straps, extra steel tubing and ratcheted straps to allow you to stretch the cover to achieve a tight fit and the perfect look, with no wrinkles. Screws, nuts and safety washers. Door: Each Polidomes structure comes with two entrances as standard. Our Geodomes can be outfitted with additional entrances, and with elegant aluminum and glass doors upon request. Ventilation: Special custom made caps at the top of the dome, and a circular opening to which climate control systems can be attached. 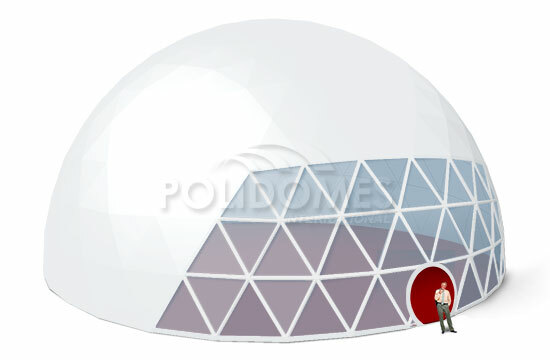 Polidomes Geodomes can be optionally equipped with a plywood flooring system with a galvanized heavy-duty structure that mirrors the structure of the dome itself. allows our geodesic dome tents to be assembled anywhere, on any terrain. The flooring system connects to the anchors and to the structure of the dome itself, providing ballast, and thus safety, with a touch of architectural elegance. The dark brown plywood floor panels are coated with an anti-slip layer, for safety. Each Polidomes structure comes with two entrances as standard. Our Geodomes can be outfitted with additional entrances, and with elegant aluminum and glass doors. Our structures can also be connected by tunnels or covered walkways, giving you an endless number of possibilities to design your own environment. To check rental prices, click here. We offer a wide variety of lighting or sound systems for our Geodomes, so you can create the atmosphere you need to turn your dream event into a reality. We also offer custom circular trussing to mount such equipment safely and securely. Inquire for more details. All of our Polidomes structures can be branded and customized using temporary self-adhesive vinyl decals, at a cost of 25 euros per square meter. Permanent full-color UV printed membranes are also available, so you can truly make your Geodome your own. Also available for rentals. All Polidomes Geodome geodesic tent structures are available with a wide range of mobile heating (both electric and oil-fired) and air conditioning systems, giving you the ability to maintain the perfect environment for your guests’ comfort. Inquire for pricing and more details. We offer high-quality, custom-made interior linings that double as projection screens, allowing you to project panoramic multimedia content across 180 or 360 degrees of your Geodome’s interior. Haven’t found the perfect geodesic dome tent?